This week Formula 1 Linksheaven has a very good article on the rookies of 2008, Nelson Piquet Jr, Kazuki Nakajima, Timo Glock and Sebastien Bourdais. If you want to know more of their backgrounds, this is the one to read. But a couple of sentences in the evaluation of Bourdais made me stop and think: "Another part of his trouble, in my opinion, is the explosive talent that is sitting alongside him in the team, Sebastian Vettel. Vettel is one of the hottest properties in F1 at the moment and Bourdais’ will be a baptism of fire." This is accepted wisdom on Vettel but I cannot for the life of me understand where it comes from. What has the baby-faced Vettel done so far to warrant such an extravagant assessment? And it is not just a misunderstanding of his result in the Chinese GP - he was being spoken of in these terms long before that race. Can it all stem from his excellent form in Indianapolis, his solitary GP for BMW? If so, it's a pretty flimsy hook on which to hang such an exaggerated reputation; Vettel qualified well, not far behind Heidfeld, but was less than a revelation in the race itself. The lad did well but not enough to make us think him anything more special than the other rookies of 2007. Yet he arrived in the Toro Rosso team with everyone expecting him to perform wonders. I can only presume that this was the result of Mario Theissen having such high regard for his young protege - and the good doctor has been right before in his assessments of drivers. But, ultimately, nothing beats actual performance on the track. So where are the results? For his first few races, Vettel was outqualified and outraced by Liuzzi; fair enough, we don't expect miracles and are quite prepared to give him time to settle in. To be an "explosive talent", however, surely a new driver has to do something a little beyond the norm? Never mind, we'll get to Fuji. And in the rain, suddenly the Toro Rosso shines. Understand, it was the car, not the driver that came good - both STR drivers performed way beyond expectations in the wet. Had Liuzzi's strategy been as well managed as Vettel's, no doubt he would have scored even more than the single point he gained. And I won't laugh at Vettel's mistake in colliding with Webber, thereby ruining both their races. Everyone is allowed the occasional error after all. It has to be the Chinese race, doesn't it? As the only GP in which Vettel has done anything remotely worth calling "explosive", Shanghai must be the foundation stone of his strangely exaggerated reputation. Yet it was another race where the Toro Rosso chassis confirmed its unexpected ability in the wet. And Liuzzi finished behind Vettel only because his tire changes were less happily timed than Vettel's; Vitantonio qualified ahead of Vettel and his fastest race lap was quicker. I am forced to the conclusion that Vettel's hype is dependent only on a lucky result in one unusual race. It's not really enough to start calling him an explosive talent, is it? In fact, if we look with an unprejudiced eye at the results, it seems that the guy is no better than Liuzzi. And I think that is a pretty accurate reflection of his real ability - he is a competent but not outstanding youngster who will get better in time but is not going to astound us with brilliant performances. The likelihood is that Bourdais will blow him away after a few races and swiftly become the number one at STR. At least Bourdais comes with an impressive record of success in other types of racing; Vettel has a very thin resumé in comparison. Of course, if the scenario you predicted occurs, then the journalists will simply assert that another property of an explosion is that it dissipates quickly. That way, they don't have to admit that their original description of Vettel was wrong. Personally, I think Vettel is good, but that it's too early to say how good he is. Also, Bordais should be able to give a good account of himself - STR politics permitting! Not sure if I agree Bourdais will or won't be the fatser driver, but for the record, I'm really not a fan of Bourdais. I've watched him race the past few years in Champ Car and his attitude, to me, stinks - especially his run in's last season with new boy Doornbos. Horrible, I know, but I'm sorry - I'm never less than honest. Though I did see an interview with him on MotorsTV and though maybe he's not so bad. I think Clive is being generous and kind in his assessment of Vettel. No harsh words, leaving the door open for civilized discussion, I on the other hand will try to remain civilized but think he's grossly over rated. Luizzi hand the upper hand on him all the remaining races unfortunately LUCK counts in the final tally and Vettel got some good luck, Luizzi got some bad luck. Bourdais? I can't form an opinion yet but surely his experience and maturity should prove of value. Vettel is still a rookie, I don't see value in a rookie. I like Vettel, actually, and hope that he proves me wrong in not seeing anything special in him as yet. It's just that his reputation mystifies me after quite a few GPs in which he did no better than many other rookies would have. At least with Bourdais one can see where the reputation comes from. Four championships in a row has to mean something, after all. But a lot is expected from him too - this coming season will be an interesting one for STR-watchers. I watched Bourdais alot over the years in Champ Car. He is a very good driver, arrogant, but most drivers are. He should be the teacher but with his unfamiliarity in an F1 car he will be a student. This team has alot of growing to do and not much time to do it. We (fans) expect greatness now. 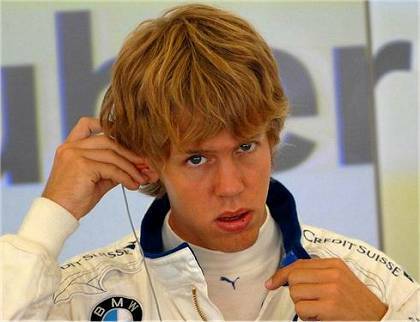 I personnaly like Vettel, but man he looks so young. He drives like an man and looks like a boy. His youth may become an issue throughout the year. All in all I like this team and hope that they have a good year. Vettel success on the wet last year showed me that he has the courage to be a champion, but his talent will have to shine this year. If the car is a dog we have to watch how he handles himself through it this should demonstrate his character. We still have much to learn about young Vettel. I think I am most interested in seeing how Bourdais does. He's been waiting for his chance so long that he really deserves to do well - but it remains to be seen how well his Champ Car skills transfer to F1. John F, I don't think looking young is necessarily a hinderance - look at Casey Stoner after all ! (Sorry to bring up MotoGP on an F1 blog, but it's the best example I could think of). Maybe being baby-faced could mean your opponents underestimate you? Could be an advantage ! I am not a great Bourdais fan so it will be interesting to see how he fares in F1. Did anyone else see the move he pulled on Power in the 2006 Gold Coast Indy? One of the most stupid moves I have ever seen at that level of motorsport - and this was from a (at the time) 2 time Champion. The sort of thing you would expect to see in amateur racing, or from a rookie. I am not convinced he will be able to cut it in F1, but I guess all will be revealed. I think Mario Theissen is as smatter than we know. Here's my take on this. Unlike McLaren who sprung their rookie on F1 cold turkey, BMW decided to test Vettel in an F1 seat in such a way as not to embarass the BMW name if he didn't work out. To be fair the STR car is no prize, Vettel's not done well and I'm really interested to see how he compares to Bourdais but the REAL TEST is wether BMW takes him back !!!!!! The problem we have is that if Vettel outperforms Bourdais then we do not know upon which driver it is the greater reflection. Its too bad that Bourdais was signed on before the end of the season, I bet Renault would be salivating to put him along side Alonso. That may have saved Luizzi's seat and we could see how well the TR car has really advanced. I only said something about his youthful looking face. You are correct about Casey Stoner. Did he just retire? He looks young also. I think that I am actually envious of their apparent youth. Happy New year to all. I do not know about you guys but I am sooo happy to see 07 go. Thanks for the weather report down under. I live on an island off the Southern New Jersey Coast, it is 45 degrees F. Please forgive that I do not know what that is in C but since Jimmy Carter left office we do not use metric much here unless you work on your own car. As far as the "if"s go Dan I don't think that this would have saved Lizzi's seat. I think that was decided after his first race. Care to revise your opinion, Clive?